Paris 24th April, 2018. The economic and public diplomacy initiatives launched by the Embassy of Pakistan to France are contributing towards strengthening of relations between Pakistan and France. 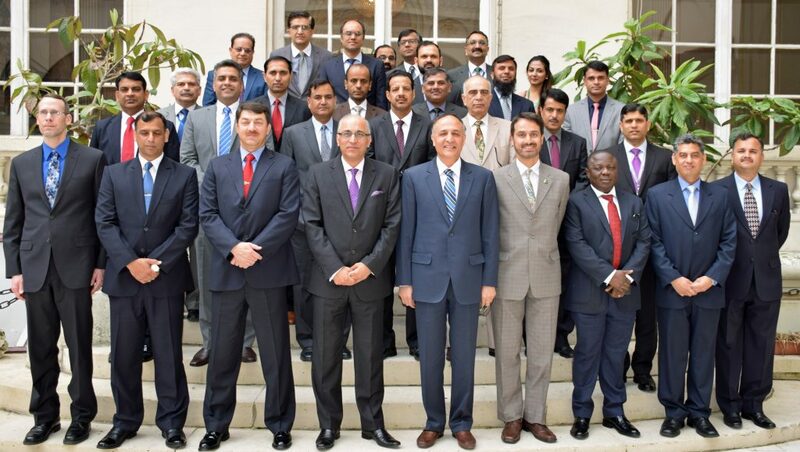 This was stated by Ambassador of Pakistan to France Moin ul Haque while briefing the 19-member delegation of National Defense University (NDU) of Pakistan which called on him at the Embassy in Paris, yesterday. 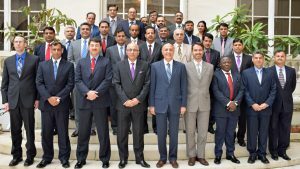 The delegation, comprising senior officers from Pakistan’s Armed Forces and allied officers from Nigeria, Saudi Arabia, Sri Lanka and USA, is visiting France as part of their National Security & War Course being held at the National Defence University, Islamabad. While briefing the delegation, the Ambassador said that Pakistan and France have a solid base for partnership in the political, economic, defence, education and cultural fields and enjoy commonality of views on many important global issues. The Ambassador said that the Secretary General of French Ministry of Foreign Affairs is expected to visit Pakistan in the near future to review and hold dialogue on whole range of bilateral relations with its Pakistani counterpart under the institutional mechanism of Bilateral Political Consultations (BPC). He noted that regular exchanges of parliamentary delegations are also contributing in bringing a qualitative change in bilateral relations. The Ambassador said that economic and commercial cooperation between the two countries form an intrinsic part of the bilateral relations and noted with satisfaction a steady increase in the volume of bilateral trade over the last few years reaching over US$ 1.5 billion in 2017. He pledged to sustain this upward momentum in the years to come to achieve a higher volume to truly reflect the potential of the two economies. Paris, 10th April, 2018. Pakistan is fully committed to the mandate and principles espoused by UNESCO and appreciates UNESCO’s valuable contributions in promoting dialogue and cultural diversity which have ameliorated lives of millions of people through education and scientific cooperation. This was stated by Dr. Shezra Mansab Ali Khan Kharal, Member National Assembly of Pakistan while delivering country statement at the 204th Session of the Executive Board of UNESCO held in UNESCO Headquarter in Paris, today. The Executive Board meeting was also attended by Ms. Audrey Azoulay, Director General UNESCO, Ambassador of Pakistan to France Moin ul Haque and 58 Executive Board members. Dr. Shezra Mansab assured the Executive Board that Pakistan would fulfill its obligations to UNESCO and would continue to work together with the global community in striving for an equitable, just, tolerant, open and socially inclusive world. The Pakistan’s representative stated that Government of Pakistan has embarked on a broad based programme for social sector development, and education especially girls education remains an area of priority. In this context, she referred to Pakistan’s voluntary contribution of US$ 10 million to setup Malala Fund to supplement UNESCO’s efforts for promoting girl child education globally. She also thanked Governments of the Republic of Korea, Italy and Qatar for their substantial contributions to this Fund. She welcomed Director General proposal for strategic transformation of UNESCO and emphasized that the new reform process should conform to UNESCO’s core mandate, ensure inclusiveness and transparency and preserve intergovernmental character of UNESCO. During her stay in Paris Dr. Shezra will also be meeting with President of General Conference, President of Executive Board and Senior officials of UNESCO Secretariat. For the last seven decades the people of Jammu and Kashmir have waged an unprecedented struggle against brutal Indian repression. The recent spate of Indian aggression carried out against unarmed Kashmiri civilians, killing more than 20 Kashmiri youth and injuring over 200 innocent protestors, is yet another testament to atrocities being carried out by the Indian occupation forces in Jammu and Kashmir. India continues to deny the valiant people of Indian occupied Jammu and Kashmir the just right to self-determination enshrined in the UN Security Council resolutions. The Jammu & Kashmir dispute is the unfinished agenda of Partition of the Indo-Pak Subcontinent and remains one of the oldest disputes on the agenda of the UN Security Council. Pakistan strongly condemns the systematic State terrorism and brutal killings of the people of IoK by Indian occupation forces. The basic human rights of the innocent people of IoK, including the right to life and peaceful assembly have been grossly violated by Indian occupation forces. Senior Hurriyat leadership has been arrested or placed under house detention. 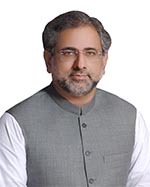 The people of Pakistan and the international community have utmost respect for the people of Indian occupied Jammu & Kashmir for their unparalleled courage, bravery and persistence in facing the worst kind of State terrorism, human rights abuses, violence and suppression by the Indian state apparatus. Pakistan calls upon the international community to raise its voice in seeking an end to the gross violations of human rights and the reign of terror unleashed by Indian occupation forces in IoK and fulfill the promises it made with the people of Jammu & Kashmir 70 years ago. 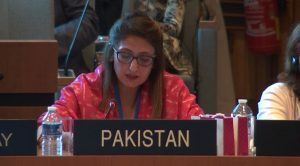 Pakistan further urges the international community to urge India to provide access to OHCHR and IPHRC Fact Finding Missions to the Indian occupied Jammu and Kashmir to investigate the gross human rights violations carried out by the Indian occupation forces. Pakistan will continue to extend its political, moral and diplomatic support to the Kashmiri people until the realization of the right to self-determination.